It is three decades since the smash hit musical Les Miserables first hit the stage in Paris. Since then the sheer drama and romance of the tale, beautiful music and incredible stage sets have thrilled tens of millions of people. The French revolution provides a dramatic backdrop for this superb show, which has woven itself indelibly into our consciousness. The massive curved Queens Theatre presents a stern face to the world but inside it’s intricately decorated at the seating levels andhas a beautiful ceiling, created in typical Edwardian Renaissance style. 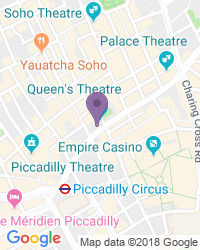 Designed by one of the era’s most prolific theatre architects, W R G Sprague, his seventh theatre, the Queen’s opened its doors in late 1907 ten months after its twin, now known as the Gielgud Theatre. Named after Queen Alexandra, wife of Edward Seventh, inside it featured a visual feast of green, white and gold, and soon became known as one of the cosiest and most welcoming theatres of its time. The theatre's first show, a comedy called Sugar Bowl, only lasted for 36 performances and the shows that followed suffered equally bad luck. In 1909 Henry Brodribb Irving, Henry Irving's eldest son, and his wife took over the lease and hosted a number of the plays his father made famous, including Shakespeare’s Hamlet and The Bells. In 1913 the building put on Queens Theatre Tango Teas, removing the seating in the stalls and serving afternoon tea to dancers. In 1914 the Queen’s Theatre’s luck changed with the hit play Potash and Perlmutter, by Montague Glass, running for 600 or so performances. In 1919 Owen Nares brought even better fortune, starring in The House of Peril, The Cinderella Man and Mr Todd's Experiment between then and 1921. The Gielgud season in 1937-38 included Richard II, The Merchant of Venice, The School for Scandal and Three Sisters, all with stellar casts including household names like Michael Redgrave, Alec Guinness, Peggy Ashcroft and Rachel Kempson. The season was such a huge success that it’s thought to have laid the foundations for the post-war Royal Shakespeare Company and National Theatre. In September 1940 a direct hit by a bomb left the building’s magnificent dome, staircase and foyer virtually destroyed, and it stayed closed for almost two decades until its reconstruction and rebirth in the late ‘50s. The foyers, bars and exterior were modernised and soon hosted the first ever Youth Theatre performance, Hamlet. In 1999 Delfont Mackintosh Theatres Limited bought the freehold. The Queen’s Theatre is the home to a very strange ghost indeed who, while never seen, is known to enjoy pinching male cast members’ backsides! Recent productions at the Queens Theatre include The Lady in the Van with Maggie Smith, Medea with Fiona Shaw, and the Royal Shakespeare Company’s productions of The Taming of the Shrew and The Tamer Tamed. 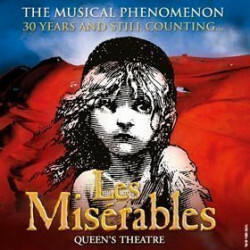 In April 2004 Cameron Mackintosh's huge musical hit Les Miserables transferred to the Queen’s from its original home at the Palace Theatre. Wheelchair users can transfer to a special seat in row D, and the theatre’s staff are happy to store your chair safely during the performance. We’re your premier destination for a wide variety of seat types and prices, with excellent availability on the full range of Queen’s Theatre tickets.